Noted. | FineStationery.com: Totes, Notes and Rachael Ray! Totes, Notes and Rachael Ray! From time to time I like to highlight new items from FineStationery.com on the blog. I have been anxiously awaiting the launch of these Smudge Ink totes & notes sets. I was lucky enough to receive a tote from the lovely ladies at Smudge for the many items I was carrying around and every time I take it with me to work or the grocery store I get so many compliments! And I'm not the only one who loves these! Rachael Ray has been spotted out and about with these bold bags on her shoulders. 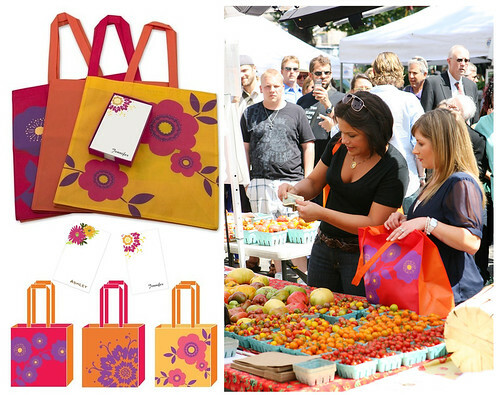 A number of us at FS are obsessed with Rachael Ray, so it is extra exciting to see her with these bags!